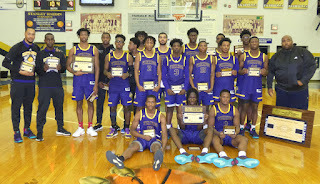 In a matchup of teams making their first appearance in the King of the Bluegrass Championship it was South Shore (Brooklyn, NY) that claimed their first tournament title becoming the fifth out-of-state champion in the last eight years. Collins got off to a great start with Marcellus Vail connecting on the first of six three-pointers to give the Titans an early 3-0 lead. A putback by Dwight Davis Jr gave South Shore their first lead of the game at 5-3 two minutes into play. A three-pointer by the Vikings' Femi Odukale capped a 12-2 run by South Shore leading 12-5. Sam Edwards only basket of the game came at the perfect time for Collins tying the game at 12-12 with a minute to play in the opening quarter. Kadary Richmond ended the first quarter with three straight points to give South Shore a 15-12 lead at the quarter break. Dayvion McKnight tied the game for Collins on the first posession of the second quarter. A Kareem May basket two minutes later capped an 8-2 run for South Shore to put the Vikings back in control at 23-17. McKnight would get the Titans back on top with six straight points to push Collins ahead 26-25 with three minutes to play in the first half. The Titans would not trail for the remainder of the half with Darrian Crittenden's three-pointer in the final minute extending the Collins lead to 7 points. A last second dunk by South Shore's Davis Jr. would cut the lead to 34-29 at halftime. The second half opened with five straight points for Davis Jr. and the Vikings as they tied the score at 34-34 less than a minute into the half. It took another two minutes though for the Vikings to take their first lead of the half with back-to-back layups by Richmond putting South Shore ahead 42-38 midway through the third quarter. The Titans wouldn't go away though with Vail connecting on another key three-pointer to tie the game 44-44 with less than two minutes to play in the quarter. A huge block by by Isaiah Richards led to a big dunk by Richmond on the other end putting South Shore back ahead with a 48-44 lead at the end of the third quarter. Collins opened the final quarter with a key spurt started by Darrian Crittenden taking a charge defensively and Vail connecting with another three-pointer. A 7-2 run by the Vikings was highlighted by a Kareem May three-pointer keeping South Shore ahead 55-49 three minutes into the final quarter. A key defensive stretch that held South Shore scoreless for two minutes was backed up by a pair of three-pointers by Vail to Collins their first lead of the quarter at 57-55 with 3:13 remaining in the game. A quick dunk by Richards on the next possession though would pull the score even at 57-57. A three-pointer for Dwight Davis Jr would give South Shore the lead for good at 60-59 with just over a minute remaining in the game. A pair of free throws by Richmond on the Vikings next possession extended the South Shore lead to the final margin of 62-59 with 32.5 seconds remaining. Marcellus Vail missed on a three attempt for Collins on their next possession and South Shore came down with the rebound before a foul on Tyson Turner stopped the clock with 1.9 seconds remaining. A foul on the ensuing in-bound pass sent Richmond to the free throw line with a chance to seal the victory for the Vikings. A miss on the free throw gave the Titans one last chance but a last second attempt by Dayvion McKnight sailed wide left as the clock expired. Collins was led by Marcellus Vail with a game-high 22 points and Dayvion McKnight added 19 for the Titans. Both Vail and McKnight earned All-Tournament Team honors for their performance. South Shore was led by Kadary Richmond with 16 points which was enough to earn Richmond Bob White Most Valuable Player honors. Dwight Davis Jr added 15 points for the Vikings. All-Tournament Team selections Isaiah Richards and Femi Odukale added 9 points and 8 points respectively for South Shore. In our second semifinal of the night it was South Shore (Brooklyn, NY) that overcame a double-digit halftime deficit to defeat four time King of the Bluegrass Champion Ballard. It was a pair of early turnovers by Ballard that got things going for South Shore who took as early 5-0 lead in the opening minute of play. Ballard tied the game at 7-7 on a three-pointer by Terrence McDaniels but the Vikings stingy defense forced turnovers on each of Ballard's next two possessions to push back ahead 12-7. It was an old-fashion three-point play the Bruins' Rashad Bishop that finally pulled them back even at 17-17 in the final minute of the opening quarter. Three minutes into the second quarter the Ballad run totaled 16-2 as the Bruins were firmly in control at 28-19. A three-pointer by South Shore's Kareem May pulled the Vikings within 8 points but they never got any closer in the first half. A 12-6 spurt for Ballard in the final three minutes sent them to the locker room with a 47-33 lead. South Shore opened the second half on a dominant 15-6 run cutting the Ballard lead to 53-48 four minutes into the third quarter. The Bruins reeled off six straight points including a three-pointer by McDaniels to extend their lead back to double-digits at 59-48. South Shore took complete control of the final 2:30 of the third quarter outscoring Ballard 11-2 to trail just 62-64 entering the fourth quarter. Less than thirty seconds into the final quarter Dante Spencer's three-pointer would give the Vikings a lead they wouldn't relinquish. Midway through the final quarter the Bruins used six straight free throws to tie the game one final time at 70-70. 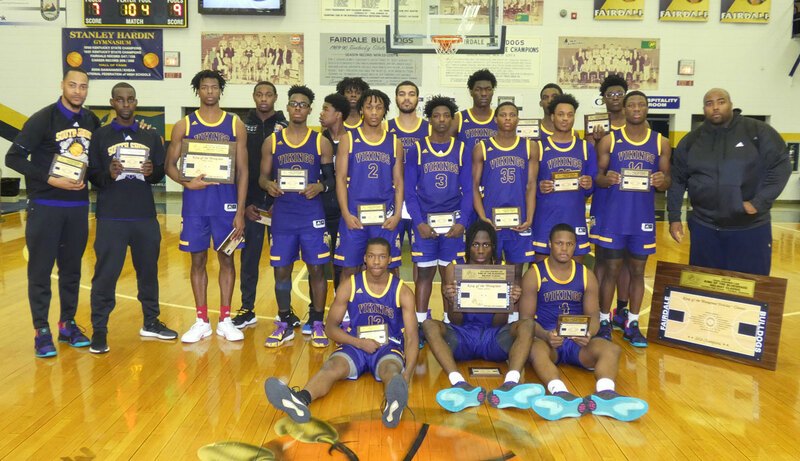 It was a 12-4 South Shore run punctuated by an Anthony Latty dunk in the final seconds that gave the Vikings the 82-74 victory and their first trip to a King of the Bluegrass championship. Ballard was led by Walter Johnson Jr. with 25 points. Terrence McDaniels added 13 points for the Bruins. South Shore was led by Femi Odukale with 16 points, Kadary Richmand with 15 points and Isaiah Richards with 14 points. South Shore will play Collins in the Championship Sunday at 7:30pm. Ballard will play Trinity in the 3rd place final Sunday at 6:00pm. No.12 Collins pulls off the shocking upset of No.2 Trinity in our opening semifinal of the night to end the Shamrocks bid for a fourth consecutive tournament championship appearance. It did not take long for the Titans of Collins to get things going in their first ever King of the Bluegrass semifinals with an early steal and basket from Dayvion McKnight giving them their first lead at 4-2. The Titans lead quickly swelled to 14-4 as they held Trinity to just one field goal over the next six minutes. A late basket by Trinity's David Johnson cut the Collins lead to eight at the end of the first quarter. A basket by Collins' Dane Kidwell extended the Titans lead back to 10 points two minutes into the second quarter. An 8-4 run by the Shamrocks cut the lead to 16-22 on a Kolton Rice three-pointer. Seven straight points by Johnson pulled Trinity within 24-28 with two minutes to play in the first half. A Stan Turnier putback in the closing seconds of the half held the Shamrocks within four points at 26-30 at halftime. Despite losing University of Louisville signee Johnson to a knee injury in the opening minute of the second half, Trinity pieced together a 9-2 run to take an early 35-34 second half lead. The Shamrocks lead extended to as many of five points following a Kamari Kenemore bucket with 2:30 remaining in the third quarter. Colby Eades' three-pointer in the final minute of the quarter pulled the Titans even at 40-40. Midway through the fourth quarter Trinity got a pair of free throws from Zach Stahlman to push back ahead 51-47. A pair of quick buckets by Kidwell put Collins back ahead 53-51 with just over three minutes to play. The Shamrocks couldn't shake their offensive woes though as they went nearly five minutes without a field goal watching the Collins lead grow to 58-53. A Jamil Hardaway basket with 9 seconds remaining in play pulled the Shamrocks within a single possession. It was a pair of free throws by Kidwell with six seconds to play that put the game out of reach with Collins claiming the 60-58 victory and advancing to their first King of the Bluegrass championship. Trinity was led by David Johnson's 18 points, all in the first half, and Kolton Rice added 15 for the Shamrocks. Dayvion McKnight led Collins with an outstanding 26 points 11 rebound effort. Dane Kidwell added 12 points for the Titans. Collins will play South Shore in the Championship Sunday at 7:30pm. Trinity will play Ballard in the 3rd place final Sunday at 6:00pm. In the final quarterfinal of the 2018 Chad Gardner Law King of the Bluegrass it was No.2 Trinity who secured their fourth straight semifinal appearance with an impressive victory over No.11 Lexington Christian. A poor start for Lexington Christian saw the Eagles miss four of their first five shots as Trinity jumped out to an early 4-0 lead in the opening minutes of the game. A three-pointer by Lexington Christian's Zeke Grier gave the Eagle some life as they took their first lead of the game at 8-6. As Trinity suffered through their own scoring drought for more than four minutes late in the first quarter the Lexington Christian lead grew to as many as six points. Trinity finally got things going offensively in the final minute of the quarter with Ethan Hodge cutting the Eagles lead to 12-8. Trinity's David Johnson scored the first nine points of the second quarter as the Shamrocks took a 17-12 lead. A Matthew Johnson three-pointer on the next possession got the Eagles within 2 points before Trinity reeled off a 16-4 run to lead 33-19 at halftime. Lexington Christian would never get closer than 14 points in the second half as Trinity outscored the Eagles 40-19. A Goldie Ashford steal and basket in the final minute would give Trinity the 73-38 victory and their largest lead of the game at 35 points. Kyle Rode led the way for Lexington Christian with 16 points and 12 rebounds. University of Louisville signee David Johnson led Trinity with a game-high 20 points and 8 rebounds. Miles Franklin and Kolton Rice each added 10 points for the Shamrocks. Trinity will play Collins in the semifinals Saturday at 7:30pm. Lexington Christian will play Madisonville in the 5th place bracket Saturday at 6:00pm. In our third quarterfinal of the night it was No.4 Ballard with a dominant victory over No.13 Walton-Verona to advance to the King of the Bluegrass semifinals for the first time since 2013. Ballard took control of the game from the opening tip jumping out to a quick 5-2 lead a minute into play. A Trey Bonne free throw pulled the game even at 5-5 midway through the opening quarter. Walter Johnson Jr responded for Ballard scoring the final 10 points of the quarter to give the Bruins a 17-10 lead. A Jack Watson three-pointer jump started an 8-1 run for Walton-Verona to cut the Ballard lead to 24-23 with two minutes to play in the first half. The Bearcats couldn't maintain the momentum though as Ballard scored the final six points of the quarter to lead 30-23 at halftime. In the opening two minutes of the second half the Bruins lead grew to as many as 11 points. A steal and basket by Walton-Verona's Kam Pardee pulled the Bearcats within 27-34 midway through the third quarter but they'd never get any closer. Johnson continued his dominance late in the third quarter scoring 9 of the next 14 points for the Bruins who quickly saw their lead grow to 17 points. It was all Walter Johnson Jr again early in the fourth quarter for the Bruins as his quick four-point spurt two minutes into play extended the Ballard lead to a game-high 21 points. A pair of three-pointers by Walton-Verona's Jack Watson helped the Bearcats put together an 8-1 run to get as close as 44-58. The Bruins rebounded and extended their lead back to as many as 18 points on three more occasions as they advanced to the semifinals with the 69-52 victory. Kam Pardee led Walton-Verona in scoring with 14 points. Walter Johnson Jr. led the way for Ballard with a game-high 24 points. Ballard will play South Shore in the semifinals Saturday at 9:00pm. Walton-Verona will play Brentwood Academy in the 5th place bracket Saturday at 4:30pm. In the second quarterfinal of the evening it was No.12 Collins holding on against No.24 Madisonville to secure their first trip to the King of the Bluegrass semifinals. It was a slow start to the game offensively for both teams before a putback by Collins' Dayvion McKnight gave the Titans a 4-2 lead three minutes into the game. It was McKnight who single handedly outscored Madisonville with nine first quarter points to give Collins a 13-8 lead at the end of the first quarter. The lead grew to 17-8 less than a minute into the second quarter following a steal and basket by McKnight. Kenny White finally got things going for the Maroons in the second quarter cutting the lead to 3 points minutes later. A basket by Madisonville's Cade Cunningham kept things close at 16-19 midway through the second quarter. The Maroons held Collins scoreless for the next four minutes with Cunningham giving Madisonville their first lead of the quarter at 23-22 in the final minute of the half. A buzzer beating three-pointer by Tyson Turner broke the scoreless streak and kept Collins on top 25-23 at the half. An old-fashion three-point play by Madisonville's Keshawn Stone capped a seven point swing to put the Maroons back ahead 30-27 midway through the third quarter. The teams would exchange the lead three times over the final four minutes of the quarter with Caleb Hawley's basket in the final minute giving Collins a 35-33 lead. Five straight points by Stone put the Maroons back in the lead with 3:38 remaining in the game. The teams exchanges the lead five more times over the next two minutes before Marcellus Vail finally put the Titans back in control at 47-45 with less than two minutes to play. Stone got Madisonville as close as one point on the ensuing possession before Collins put the game out of reach with an 8-2 run to close the game. The 55-51 victory sends Collins to the semifinals in just their second tournament appearance. Cade Cunningham led Madisonville in scoring with 13 points and Keshawn Stone added 12 points for the Maroons. Collins' Marcellus Vail led all scorers with 16 points and Dayvion McKnight added 15 points, 11 rebounds and 6 assists for the Titans. Collins will play in the semifinals Saturday at 7:30pm against the winner of Lexington Christian/Trinity. Madisonville will play in the 5th place bracket Saturday at 6:00pm against the loser of Lexington Christian/Trinity. The first quarterfinal of the 2018 Chad Gardner Law King of the Bluegrass was a battle of out-of-state foes as former champion Brentwood Academy's late run fell short against South Shore. The two teams battled early in the opening quarter with Femi Odukale's five early points giving South Shore the early 7-3 lead. Sophomore Randy Brady scored five of Brentwood Academy's next seven points pulling the Eagles within one point on three different occasions. A three-point basket by Marcus Fitzgerald tied the game at 13-13 with 2:39 remaining in the opening quarter. It was a 10-0 spurt by South Shore to end the quarter with the Vikings leading 23-13. The Viking lead grew to as many as 12 points early in the second quarter before Fitzgerald connected on a pair of three-pointers that led to a 8-0 Brentwood Academy run cutting the lead to 25-21. The South Shore defense came alive in the final four minutes of the half holding Brentwood Academy scoreless while forcing three late turnovers to take a 30-21 lead at the half. The Eagles never got closer than seven points in the third quarter as the stifling South Shore defense converted seven turnovers into 10 points while extending their lead to as many as 18 points. A pair of field goals by South Shore's Kadary Richmond grew the lead to a game-high 20 points two minutes into the final quarter. A late 11-3 run by Brentwood Academy was started by 6 straight points from Marcus Fitzgerald to cut the South Shore lead to 64-56 with a minute remaining in play. A missed free throw by Kareem May in the final minutes gave the Eagles an opportunity with Brady headed to the free throw line in the final 35 seconds. A pair of missed free throws looked to doom Brentwood Academy before an offensive rebound landed in the hands of Adam Wass who connected on a three-pointer to pull the Eagles within 65-59. It was too late though as Odukale connected on the first of two free throws sealing the 66-59 victory for South Shore. Brentwood Academy was led by Marcus Fitzgerald and Randy Brady with 27 and 22 points respectively. South Shore had a trio of players in double digits including Isaiah Richards (16pts), Kadary Richmond (15pts), and Femi Odukale (14pts). South Shore will play Ballard in the semifinals Saturday at 9:00pm. Brentwood Academy will play Walton-Verona in the 5th place bracket Saturday at 4:30pm. In the final first round contest of the 2018 Chad Gardner Law King of the Bluegrass it was No.11 Lexington Christian that was dominant against No.7 University Heights. Lexington Christian got off to a great start jumping out to an early 7-2 lead. The Blazers rebounded with a run of their own holding the Eagles scoreless for nearly four minutes as they University Heights took a 9-7 lead. The teams would exchange the lead four times in the final three minutes of the quarter with a pair of free throws by Kyle Rode giving Lexington Christian the 12-11 lead at the quarter break. Stout defense by the Eagles would force 10 straight missed baskets for University Heights as the Lexington Christian lead grew to as many as 15 points with two minutes to play in the first half. A pair of late baskets by Xavier signee KyKy Tandy cut the Lexington Christian lead to 26-16 at halftime. Drew McGowan pulled University Heights within 9 points on two seperate occasions in the opening four minutes of the second half but the Blazers got six straight points from Rode midway through the quarter to keep their lead comfortably at 13 points. The Eagles took a 46-33 lead into the final quarter but couldn't stop a final surge from the Blazers to cut their lead to 49-44 with five minutes to play in the game. A basket by Tandy held University Heights within five points before Lexington Christian constructed a late 12-5 run to clinch the victory 63-51 and advance to the quarterfinals. KyKy Tandy led the way for the Blazers finishing with 19 points. Lexington Christian was led by Kyle Rode with an outstanding 27 point, 15 rebound and 5 assist performance. Will Hacker added 13 points for the Eagles. Lexington Christian will play Trinity in the quarterfinals Friday at 9:00pm. University Heights will play LaRue County in the consolation bracket Friday at 9:00pm.